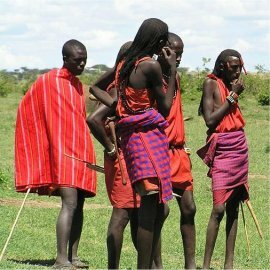 The history of the Masai goes back hundreds of years, though much of the early history comes from the oral traditions of the Masai themselves. The Masai - also spelled as Maasai - currently live in a large corridor of land between Kenya and Tanzania. Due to the lack of written sources, trying to pinpoint the origins of any one tribe is difficult. Many historians feel that the Masai have existed as a people for as long as 3000 years. The history of the Masai is really limited to what we know of them from the past few hundred years. It's thought that the Masai migrated from the Nile valley region in the 1500s and over the course of 200 to 300 years, finally came to take over the Great Rift Valley. Due to the wide-ranging nomad lifestyle, where they travelled great distances to keep their herds of cattle fed and watered, the Masai claimed a large portion of the Rift Valley as their land. At its peak, the Masai held land covering the entire Valley. The warriors of the Masai were a formidable force in the area, and they were responsible for much of the territory expansion as they conquered their neighbours, or stole their cattle. Even the invading Arab slave traders chose to steer clear of the Masai. But the powerful Masai would face a downfall towards the end of the 1800s. Not only was their population devastated by years of drought and epidemics of small pox and rinderpest, their lands were taken from them by the Kenyan government. Much territory was taken to form wildlife preservation parks, like the Masai Mara game preserve and the Nairobi National Park. The Masai's land was also reduced by the arrival of white settlers who claimed land for their ranches. Estimates say that two thirds of the Masai land was taken from them. Not only was their land taken for settlers in the 1800s and early 1900s, missionaries became a common sight. They came to try and "civilize" the savage Masai whose bare dressing habits and other primitive habits shocked the white people. Today, a large number of Masai have converted to Christianity, but haven't actually changed any of their traditional habits because of it. With the loss of their land, many Masai are no longer able to survive in their old ways, and are now forced to find "modern" jobs in order to earn a living. 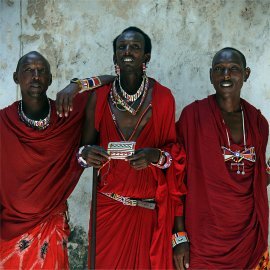 They are often employed as local tour guides, and many Masai are involved in tourism by performing dances and selling hand-made beaded jewelry. Though their time of prominence in Africa may be over, the Masai survive to remind us of the proud and prosperous people they once were.